Just another number to most everyone who will read this column, but 632 symbolizes quite a lot in at least one Snyder County household. 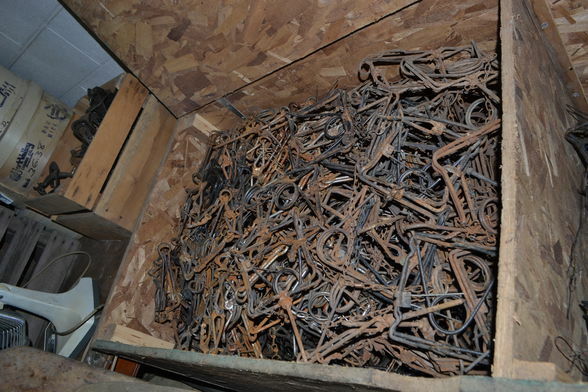 That’s how many traps we have sorted and boxed as of Saturday in preparation for a large sale with a huge variety of outdoors items, tools and much more to be held in rural Selinsgrove later this month. 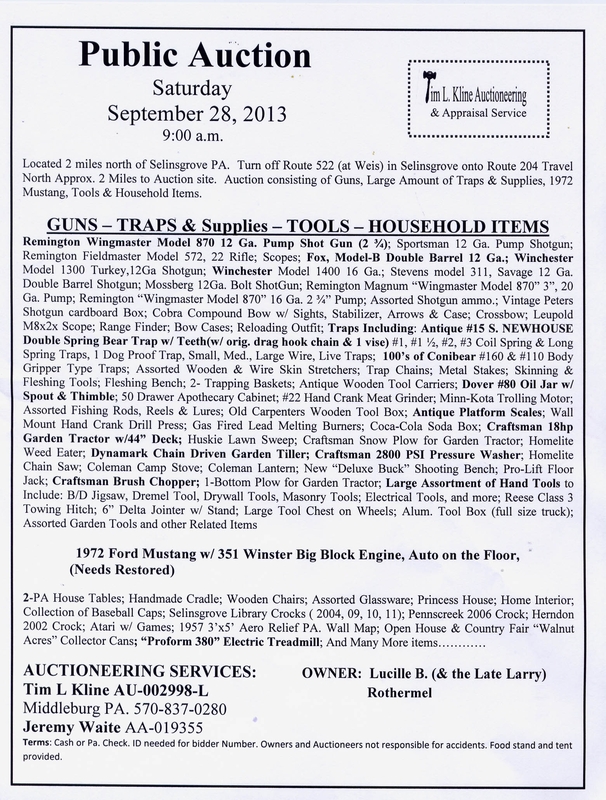 According to auctioneer Tim Kline, in his 26 years in the business, he has never seen so many traps sold at one event. Leg-hold traps, coil-spring traps and connibear traps, among others. All sorts of brands, sizes and styles, not to mention a wide assortment of other trapping and hunting supplies. And the question it seems most people keep asking as they try to digest such a collection is how does one person wind up with such a large assortment of traps? That’s where the true significance comes in. Every fall and early winter Pappy would meticulously tend to his traps. He’d skin hundreds of muskrats and raccoons each year and sell the furs at local shows. He didn’t do it for the money — there are much easier ways to earn a few extra bucks. Instead, trapping was a way for Pappy to hold onto the memories he had of his son, who passed away decades ago. He and Pappy loved trapping, hunting and fishing together. For more than 20 years, Pappy continued that tradition, one trap at a time. This Thursday will mark the one-year anniversary of Pappy’s death. Each time we added another sorted box of connibears or coil-spring traps to the growing stack, it was hard not to think of hunting and fishing trips and the special memories created. The double-whammy for our family was my own father passing away six months ago, and all the emotional outdoors-related memories tied to his legacy. As my mother went through some of his items to add to the sale bill, she found a pair of old recurve bows decorated with a series of stickers and notches signifying each deer he harvested with each bow. She counted 30-something on one bow, more than 20 on another. Between the two fathers lost, there are numerous firearms, ammunition, arrows, old movie reels of hunting cabin capers, pictures and countless memories. They say it is impossible to measure a father’s love. Our dads loved hunting, fishing, trapping and so many other outdoor activities. They loved their families, their spouses, children and grandchildren. They loved in ways no tape measure, scale or ruler could ever quantify. It is beyond our ability to comprehend. So for those of us who still try to put a number to it, 632 is just a small step in that direction. For pictures of some of the many sale items, click here. ~ by zaktansky on September 7, 2013. It’s always tough losing a loved one and it’s always a memorable journey when you’re tasked with going through their possessions. As I went through my grandfather’s gear and such, I wanted to save every little thing. Sadly, holding onto those items may be reminders but nothing ever replaces seeing them smile or spending time with them. Beautiful post. Thanks Duncan. We’re hoping the sale goes well and we have a good turnout. There definitely is plenty of stuff to make it worth while for people to stop in. Actually, just found six more traps as we go through tools. Change that number to 638! This entry was posted on September 7, 2013 at 11:46 pm and is filed under Camping, Guns and shooting, Hunting, Wildlife, Youth Related.You can follow any responses to this entry through the RSS 2.0 feed.You can leave a response, or trackback from your own site.